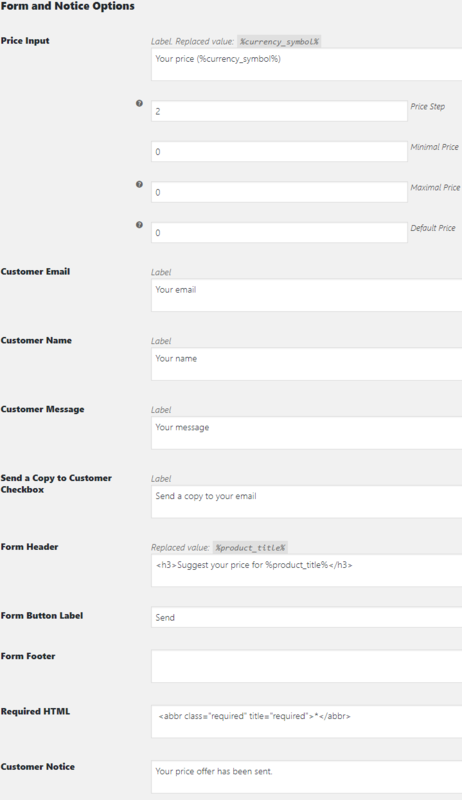 WooCommerce Offer Your Price module allows your customers to suggest their price for products by adding a form to product pages. This section allows you to choose what products have the “Offer Your Price” form on their pages. Choose what products have the “Offer Your Price” form. Possible values: Enable for all products; Enable for all products with empty price; Enable per product; Enable per product category. 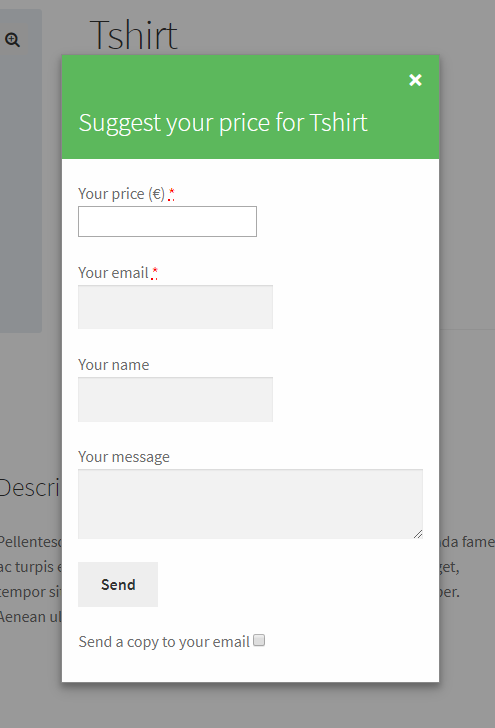 Add product categories where “Offer Your Price” form should be shown. Ignored if “Enable per product category” option is not selected above. Set button that opens the form label. Choose button position on Single Product page. 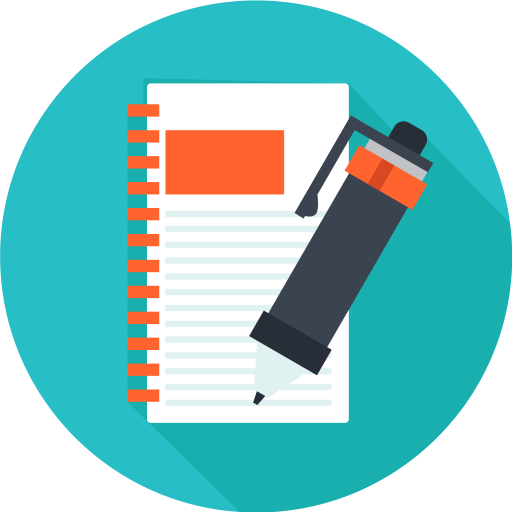 Possible values: Do not add; Before single product; Before single product summary; Inside single product summary; Before add to cart form; After add to cart form; After single product summary; After single product. Set button priority on Single Product page. Choose button position on Archive pages. Possible values: Do not add; Before product; After product. Set button priority on Archive pages. Add custom hook. If adding more than one hook, separate with vertical bar ( | ). Ignored if empty. Add custom hook priority. If adding more than one hook, separate with vertical bar ( | ). Set the number of decimals. Set the highest price. Set zero to disable. Set default price. Set zero to disable. Set email input field label. Set customer name input field label. 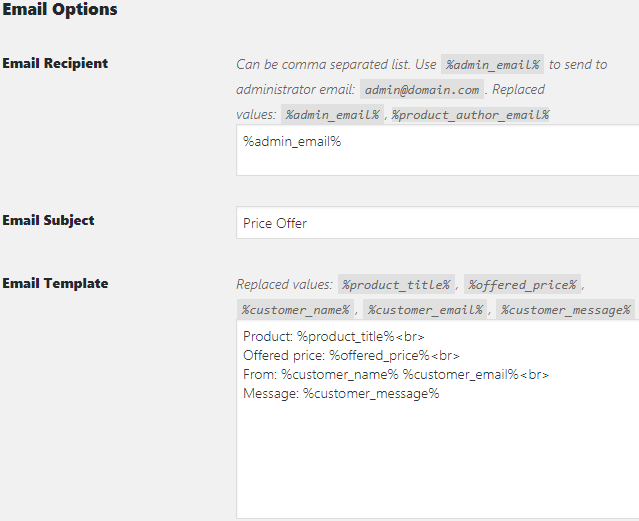 Set customer message input field label. Set “Send a copy to your email” option label. Set the “Send” button label. Set the form footer text. Set the customer notice text. Default: Your price offer has been sent. Set the form header background color. Set the form header text color. Set the form footer background color. Set the form footer text color. 1) I have the feature globally activated which is ace, it just applies it to every product, done! However, there are one or two items that it just does not make sense to have the make offer option on. If there was a way to switch off individual listing but still having it globally enabled I think that would be awesome and useful to most I feel. 2) (selfish tweak) I am using your product availability by time and date feature. Which I will tell you is a feature I did not know I even wanted until I saw it on your list. However, it has now become fundamental to the way I want to run my site. Is there any way to link the make offer button to appear with the availability times. Or even better to choose if you want it available of the time or with the times set just in case you do want to add it back on all the time. 3) (incredibly selfish tweak) Nothing to do with the make offer button per se but more linked to what I am trying to achieve with your two features of availability by time/date and make an offer. Is there any way to make user products available by role, so that a product listed by a user becomes draft/hidden when/if their role changes. Let me explain why. My site has become more of a membership site because of your features and I am actually delighted that I can do it that way. The issue is I have created membership roles which are purchased through a product. Incidentally, it is those products I don’t want the make offer button on. Once the product is purchased the user role changes to a vendor and they can add their products. I using your user products feature too for certain items. However, when the membership expires the role changes back to customer/subscriber but the products are still visible. I thought if you had an availability by role feature that could set the status of the products to draft and re-changes back when the role changes again. Incredibly selfish I know but probably another feature that someone would find useful too. Need a custom label features so that we can add new labels please check to it. Hi, I am trying your plugin with the Whole Woocommerce setup locally, and for the first time I need just to understand how those automated emails work. So can you help me in a few line which system is managing the email sending ? I tried first this “offer” option on my localhost but didn’t receive anything… So is it only because it’s on localhost or will I also need to setup a specific email sending system. If so which would you recommend, knowing that I use C-panel ? I hope you can help me in this task. I assume other emails (not send by Booster) don’t work either? I would recommend reading this page to understand how emails in Woocommerce work – https://docs.woocommerce.com/document/email-faq/. I downloaded your plugin and installed it. I tried a single feature – Offer Your Price – and it doesn’t work! It displays the button, using the defaults but nothing happens when it’s pressed. I’ve tried different PCs and phones, from inside the LAN and outside but it doesn’t work. I’m using the latest WordPress release. Do you have a demonstration website, or YouTube videos showing the back and front end of our complex product? Any chance you can get yourself a copy and test this please ? Hello, great work booster team. This looks good, but I can’t see how the seller accepts/counters the offer once they receive one from the buyer? Once the offer is received, administrator can see the offer in the backend and create an order manually on their behalf or communicate with the customer via email that they have provided.